Enjoy movie nights even more when your entertainment center is clutter-free with this stylish black pier. With three shelves, a lower tier and two drawers, you'll have plenty of space to hide away any unnecessary clutter while keeping selective decorative essentials on display. Pair this with the matching black TV Stand (Model #14856 or #14857) to complete the look! Available in black with chrome accents and hardware. 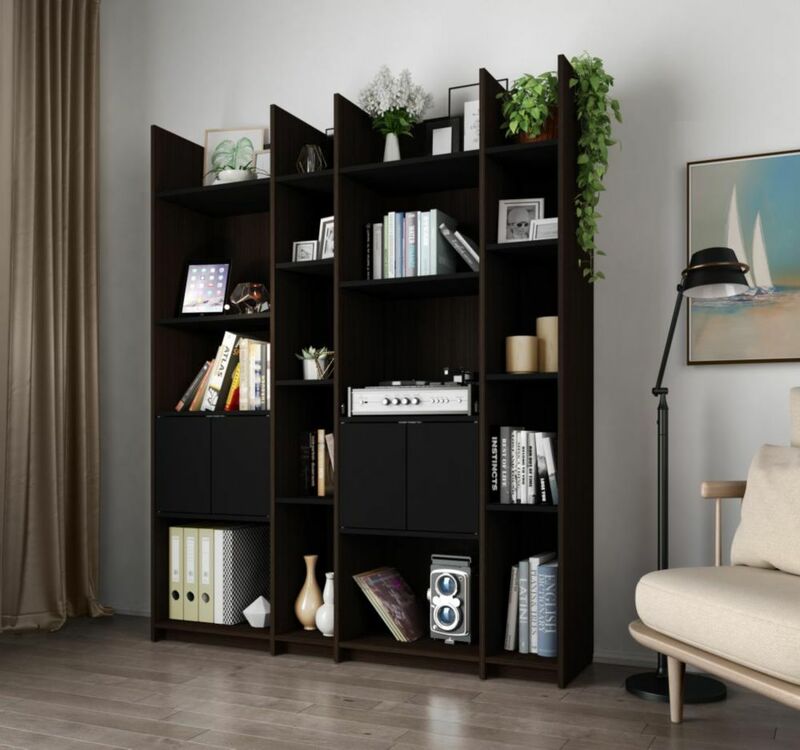 Small Space Storage Wall Unit - Dark Chocolate & Black Within a compact space, choosing the right pieces of furniture is crucial in order to feel relaxed and comfortable. Maximize every square foot of your room with Bestar's Small Space units! This Storage Tower set includes one 20-inch Tower, one 19.5-inch Add-on Tower and two 9.5-inch Add-on Towers. Each tower features 2 fixed and 3 adjustable shelves. The top and the bottom shelves of each tower are fixed. The doors can be installed between 2 of the 3 adjustable shelves for a unique design. If the 20-inch Storage Tower and the 19.5-inch Add-on Storage Tower are connected together, the doors can't be installed at the same height. Assembly Required.